This is a series of food experiments by an Indian foodie YUMMRAJ in Vietnam. It will cover different food places & interesting stories of food & people. An amazing place for foodies if u r open to experiment with food, almost everything is freshly made & served , super simple yet very delicious, an array of restaurants – almost every 4th shop is an eatery, pocket friendly yet u end up paying hundreds of thousands for a meal!!!!! Vietnam’s currency is horribly devalued. So I was paying in lacs for every meal e.g. 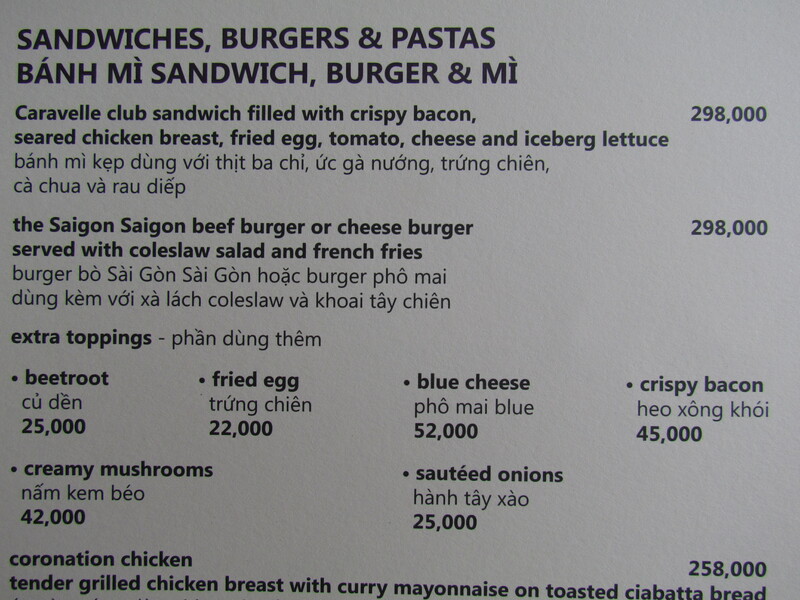 VN$ 160000 for a meal which is equivalent to Rs. 437 !!!! 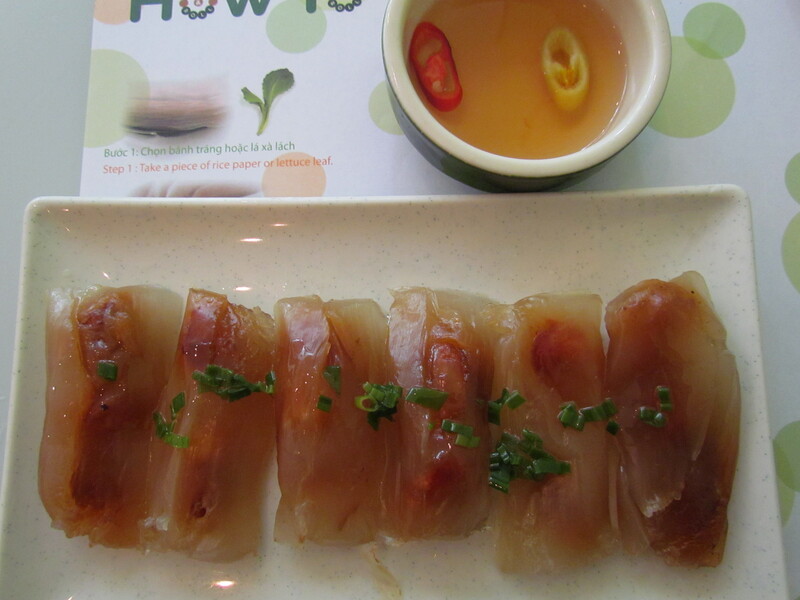 It was a challenge while browsing thru the menu card – to ensure I was not going overboard. 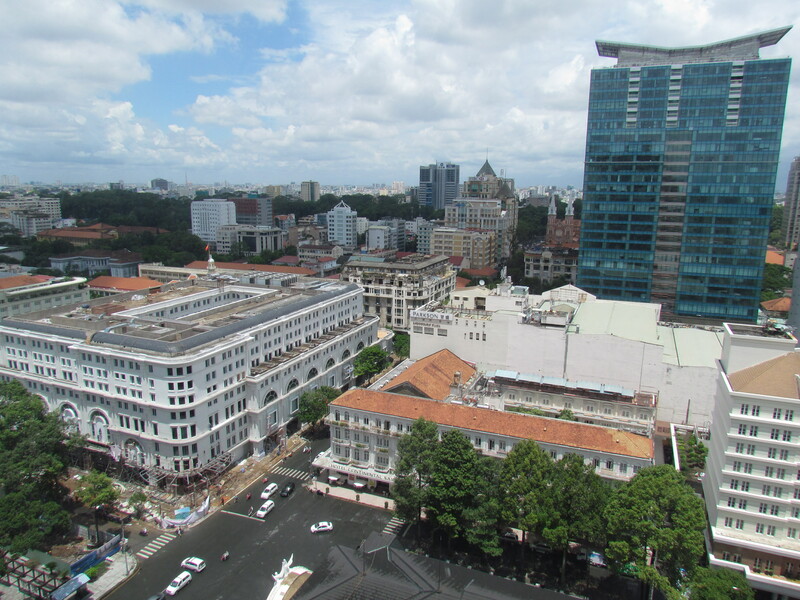 Ended up in Vietnam to attend a training program. Before I set out my friends told me – no need to eat in expensive restaurants. Just go out & eat anything on the streets or small eateries – even they serve good food. My first meal after I landed in Vietnam last week was PHO. 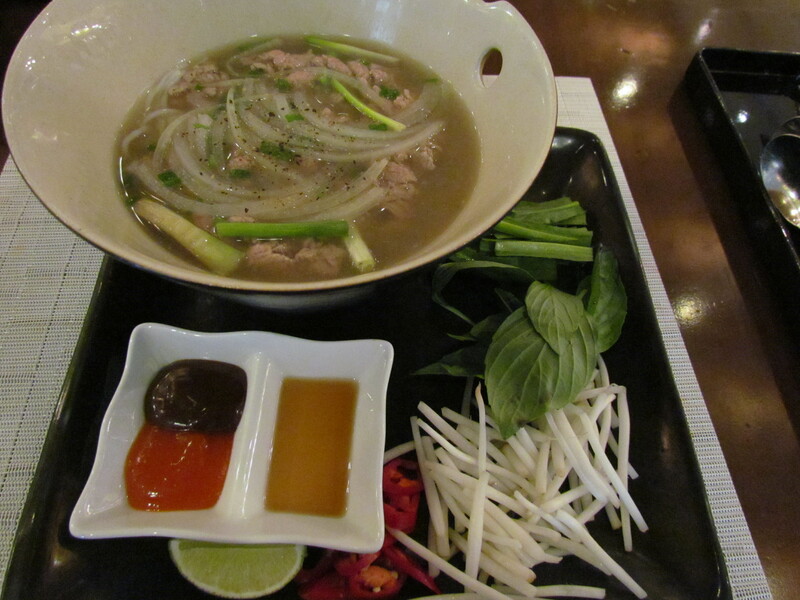 This is a famous traditional Vietnamese Noodle soup. I went for the beef option. This comes in many other options as well – pork, lamb, chicken, seafood etc. The restaurant was at the famous Caravelle Hotel. As I sat down for lunch the Lady brought me the menu card. I asked for Vietnamese section & instead of just showing me the section, she started talking – ‘Is this ur first time in Vietnam’, food preferences etc. Then she emphatically suggested ‘ Pls try PHO’. I agreed. As she served the food, I asked for fork as I am not good with chopsticks. She said ‘Why don’t i try chopstick. 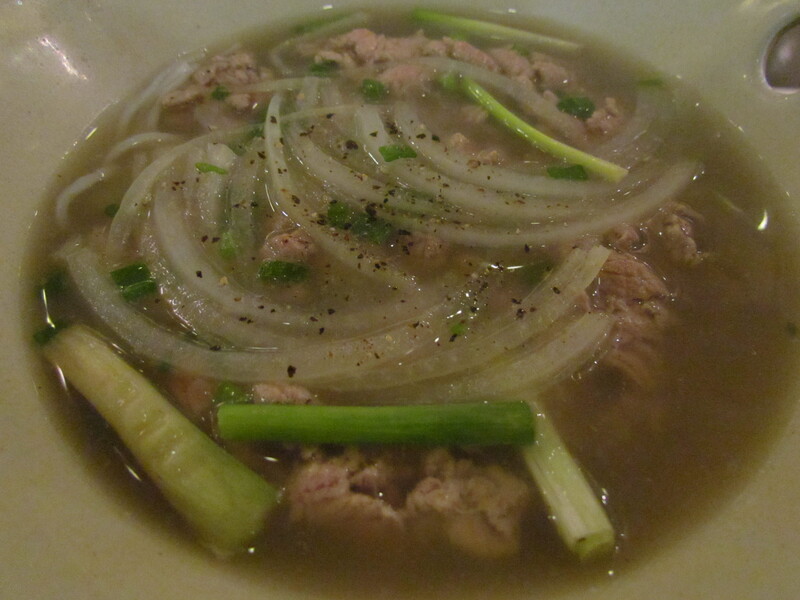 Pho is enjoyed better with chopstick’. I said’ but I am not good at it’ . She said ‘ No probs. U can just try. In fact there r is almost no more guests this afternoon. So no one to feel shy about – there is a first time for everyone’. I was amazed – This was not traditional restaurant interaction but was very very warm. It felt a lot different than a customer – server conversation. The pho was served with a variety of condiments – 2 kinds of leaves (I cud not understand the name even after asking thrice), sprouts, sliced red chillies, 2 kinds of sauces (a sweetish red one & a soya) & a dip. The noodles were thicker than maggi, quite straight, soft & superb. The soup was made of stock that was unparallelled. The intensity of flavors & taste was awesome. The beef pieces in the noodle soup were soft & non chewy. The next meal I had was when I went out for a long stroll on the streets. 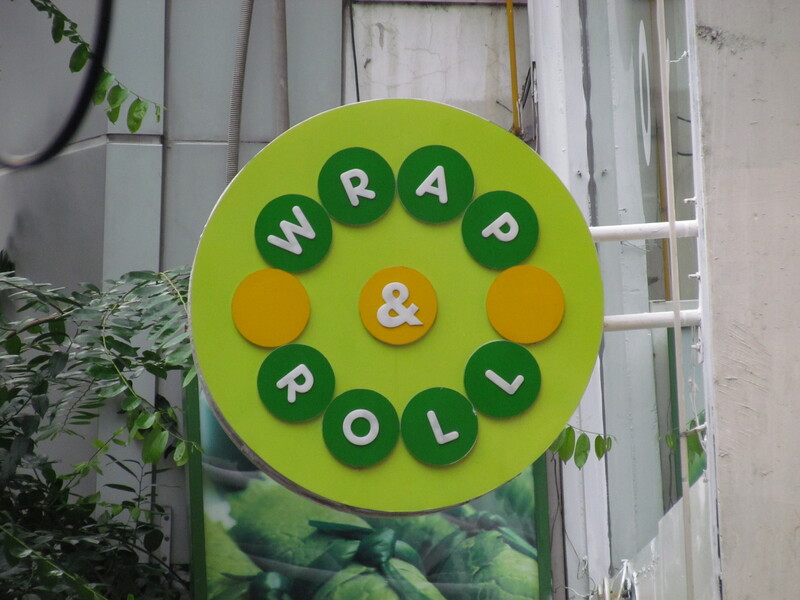 I saw an Eatery named Wrap & Roll. Rolls, as I had figured out, r a popular food item here in Ho Chi Minh City. The restaurant had a super colorful menu card with detailed description – I wud have been lost without the details. 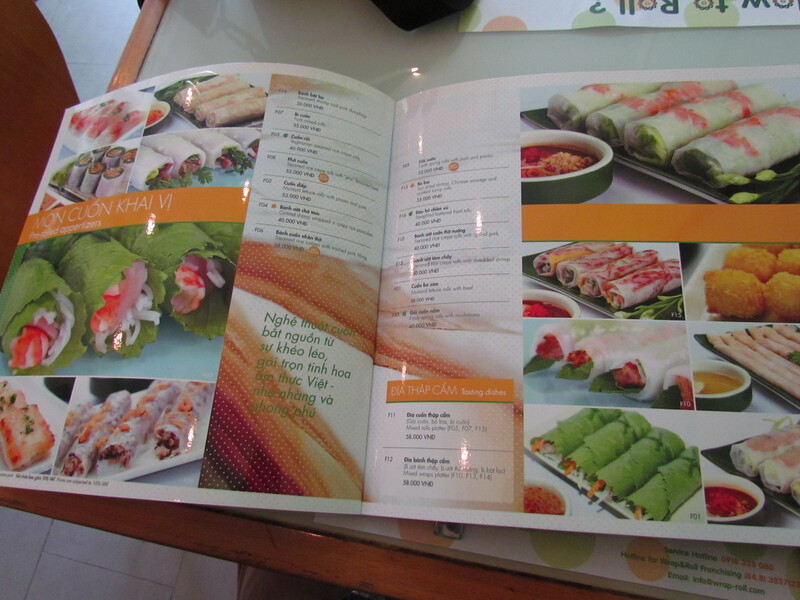 Almost 70% food mentioned in the menu card had pics. I went for ‘Banh Bot Lot’ – means ‘Steamed shrimp & pork dumplings’. The shrimp is made into a paste & mixed with the base of the dumpling – in this case rice paste. Marinated Pork balls are then put in the middle. The resultant texture is very unique – soft, not slimy but a slight bit sticky. Wow to taste & outstanding flavors……. slurp slurp……………. Alas, I am yet to come across such good dumplings in India. Post the ready made roll, I ordered Cuon Bun Cha Ha noi – Grilled pork with vermicelli & veggies, eaten in a roll that u have to make urself. There is a flowchart of how to make the roll – written on the table mat. The roll base is served separately. 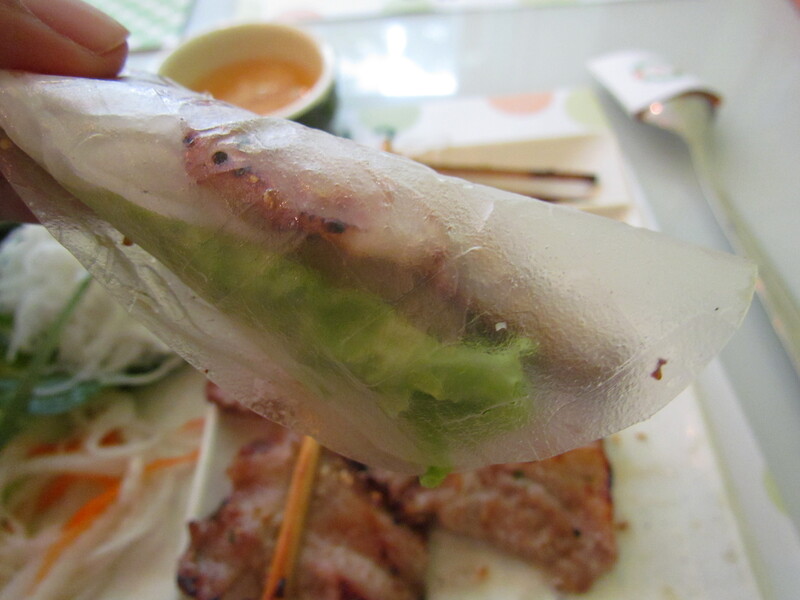 It is also made from rice & is so thin that it ends up being translucent. I wonder how they are made!!!! 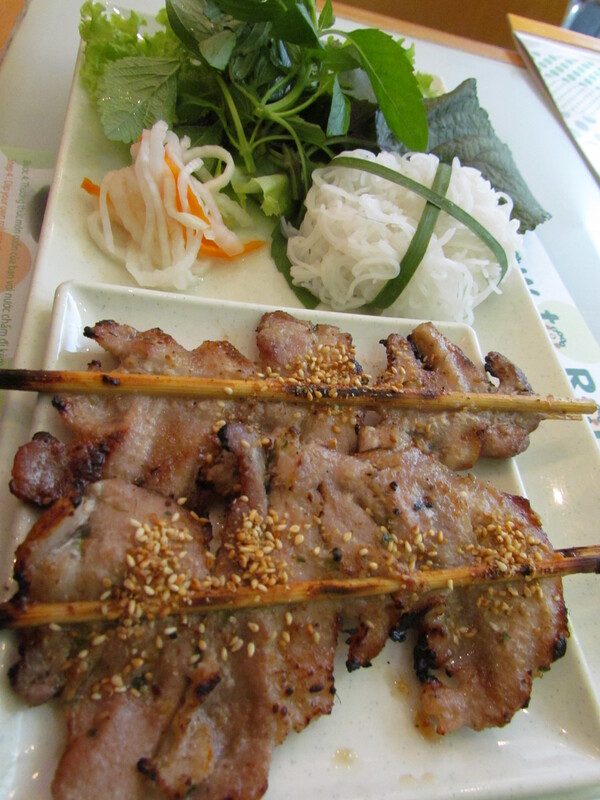 The condiments included Grilled pork, assorted vegetables, unknown leaves (unknown to me) & boiled vermicelli!!!!! Vermicelli inside a roll!!!! I started making different permutations & combinations with every bite – with the veggies, without the veggies but with the leaves, only veggies & leaves etc. The roll tasted great in almost all forms just as it is. It tasted good with the dips as well. I had this roll earlier at Blue Ginger, Delhi. There of course the roll was premade & served with sauces already in it. Vietnam is one place that’s on our wish-list… Congratulations on turning a year old… lots of wishes for many more food stories to come. Vietnamese food and Filipino food I believe will be the next ‘Chinese’ cuisine in the world – the rage is catching on in many places of the world. I did not know of the rage coz India is yet to catch in on that trend. Great to know that coz the food is simply awesome. simple yet delicious………. 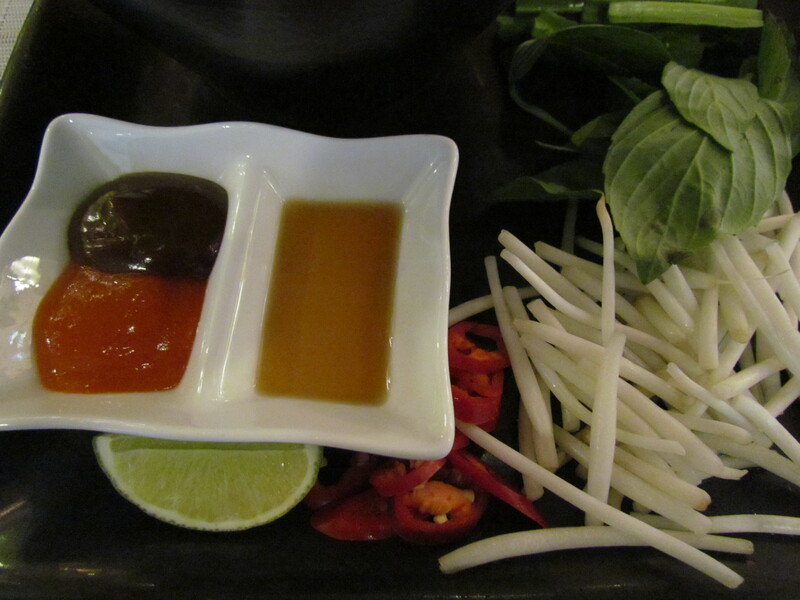 Three condiments with your Pho are Hoisin, Chilie and fish sauce.